Looking for a place to meet your friends for a drink? 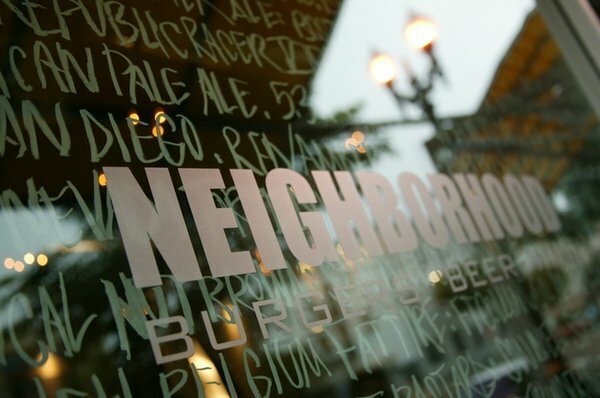 Neighborhood is a great Hotspot in East Village at the heart of Downtown San Diego where you can find a wide selection of locally brewed beer, 27 choices of beer on tap! Most importantly (since I don’t drink, well maybe just a little wine) a menu selection of traditional American dishes with a contemporary flair! Open for lunch and dinner you will find menu items like Cheddar Corn Dogs served with a Mustard Seed and Chipotle Aioli and Jalapeno Mac and Cheese. Familiar foods with an added twist! Interesting huh? Want to know the real reason that I am drawn to this place over and over again? It’s the Sweet Potato Fries! They are the best in town. Yes, sweet potato fries are my weakness and I have tried them at many places. Nobody can top them here! They are perfectly fried, not over cooked or too soft. Just right. And the Peppered Malt Mignonette and Goldmine Shaft Cheese Crumbles (I know, I don’t know what those mean either) that the fries are served with make them unbelievably addicting. If I could best describe the toppings, they taste like a peppered white balsamic vinaigrette and blue cheese and chive topping. The combination all together tastes like comfort food heaven. If you’re watching your waist, Neighborhood also offers healthier menu options. I’ve had two of their meatless burgers, The Beet Burger and The Black Bean Burger. Both delicious. I also recommend their Roasted Chicken Sandwich and unique selection of salads. The staff is friendly and the casual yet elaborate mix of atmosphere will surprise you!